The quijada, charrasca, or jawbone (in English), is an idiophone percussion instrument made from the jawbone of a donkey, horse or mule cattle, producing a powerful buzzing sound. The jawbone is cleaned of tissue and dried to make the teeth loose and act as a rattle. It is used in music in most of Latin America, including Mexico, Peru, El Salvador, Ecuador, and Cuba. Veracruzan jaranera women playing the jawbone. To play it, a musician holds one end in one hand and strikes the other with either a stick or their hand; this causes the teeth to rattle against the bone creating a loud, untuned sound, specific to this instrument. The stick can also be pulled along the teeth which act as a rasp. These ingredients provide the basis for a wide variety of combinations and rhythms. Peruvian musician playing Afro-Peruvian music with the quijada de burro. While it is used in most of Latin America, the quijada originated from the Africans that were brought to the Americas during the colonial era. It is believed that it was first introduced in Peru, making it an Afro-Peruvian instrument. It is a mix of African and indigenous cultures that created an instrument that gained value from the people of Latin America. It is one of the main instruments used by Afro-Peruvian musical ensembles and is used in many other Latin American cultures, like the candombe of Argentina (in Uruguay it is not used), Costa Rica, the Dominican Republic, as well as Mexican music by son jarocho and "Costa Chica" ensembles. An example is a song played in Oaxaca, Mexico in which the quijada keeps the beat. 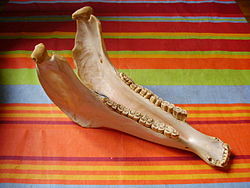 The quijada de burro (quijada made of donkey jaw) is most often used at carnivals and religious festivals. ^ "Jawbone". Virginia Tech Multimedia Music Dictionary. Archived from the original on 2014-10-22. Retrieved 2013-09-15. ^ a b c Scruggs, TM (2007). "El Salvador". Grove Music Online. Oxford University Press. Retrieved 2013-09-15. ^ Ma, Eve. "A Guide To Afro-Peruvian Musical Instruments". Sounds and Colours. Retrieved 2013-09-16. ^ "Quijada de Burro". Retrieved 23 September 2013. This page was last edited on 8 November 2018, at 18:27 (UTC).